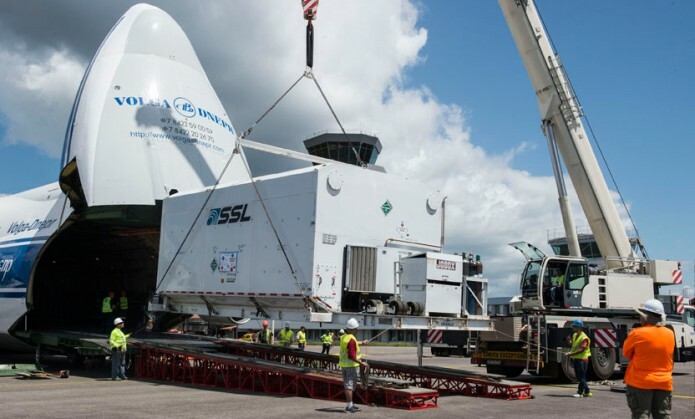 Protected by its shipping container, Intelsat 36 is unloaded from the An-124 cargo jetliner following this SSL-built satellite’s arrival at Félix Eboué International Airport in French Guiana. 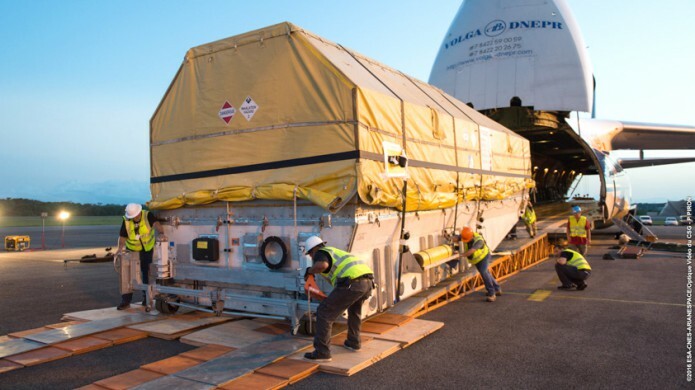 Payload preparations for Arianespace’s next Ariane 5 dual-passenger mission are moving into full pace with today’s delivery of the second satellite, Intelsat 36, to French Guiana – joining Intelsat 33e, which arrived earlier this month. The newly-delivered spacecraft was flown to South America aboard an Antonov An-124 cargo jetliner, which landed this morning at Félix Eboué Airport near the French Guiana capital city of Cayenne. After the unloading process, the protective container with Intelsat 36 was readied for transportation by road to the Spaceport, located some 65 kilometers away. Built by SSL (Space Systems Loral), Intelsat 36 will enhance international satellite operator Intelsat’s premier direct-to-home neighborhood in Africa – providing coverage from an orbital position of 68.5 deg. East. Its liftoff mass is estimated at 3,250 kg. Accompanying Intelsat 36 on the August 24 launch to geostationary transfer orbit is another satellite for Intelsat’s fleet, Intelsat 33e. Produced by Boeing Space Systems, it is the second Intelsat EpicNG-series spacecraft and integrates one of the most advanced commercially-available digital payloads in the world. Intelsat 33e has a liftoff mass estimated at 6,575 kg. and will operate from an orbital position of 60 deg. East following its launch. Ariane 5’s mission with Intelsat 33e and Intelsat 36 is designated VA232 in Arianespace’s numbering system for its family of launchers, which also includes the medium-lift Soyuz and light-lift Vega.